Inspired by TIAS, I present to you NATS. 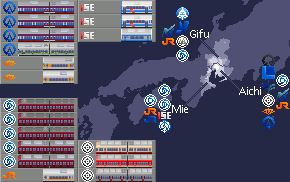 This set intends to include a whole lot of trains from the Nagoya Metro Area, which encompasses Aichi prefecture, Mie prefecture and Gifu prefecture. Like TIAS, the trains in NATS have a set length. So far 11 operators have been finished. Aichi Rapid Transit/Linimo will not be included as it is a part of RIMS, which can be balanced against NATS, TIAS and the Japan set using the parameters. 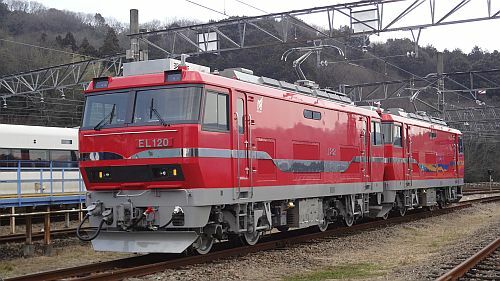 Trains other than the Linimo can also be disabled. Fixed: Correct sprites now used for JRC 119 and 373. Fixed: Fixed alignment issues with EL 120. Changed: Purchase window graphics now line up properly with TIAS. Changed: Trains now look better in depots. Changed: Darkened the pantographs to make them look better. This set will be huge when finished; it will have almost 200 trains. To finish this in any reasonable timescale, your help would be greatly appreciated. I'm about 20% the way through. I have a tracking table where you can see what has yet to be done, and what has already been done, and by who, so you won't have to do work that has already been done. Last edited by Erato on Sat Aug 04, 2018 1:48 pm, edited 8 times in total. Well, i saw it just when it was posted, downloaded it and quickly put in ithe 'newgrf' file. Yet it's quite good, but you could maybe make generic cars adapting to the traintype. NARS does that, 2cc does that, your MMT does that. It's just that my subways are usually 2-car (1 tile), as i need to take as less space as possible in my towns. Well i'll do with it, i may use them as commuter trains. Excellent, more Japanese content always welcome. I also started some work on Kintetsu, but that's such an undertaking, because it is so big, it will be a while until I'll include it. I'll start work on Yoro Railway soon and will continue with I think Gifu Prefecture. The sound of the horn when the train departs is output as the sound of the steam locomotive horn. I didn't realise that, as I never play with sound on. It should be fixed in the next update. Aichi prefecture is now done, save from major railways. Im working on Meitetsu trains. I know you didn't fancy doing one, but if I paint an EL120...? But I personally feel the saturation of red is a little low. So exams are over and I can, once again, start work on NATS. 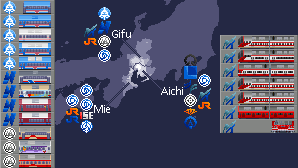 Gifu Prefecture is now done and I'll start implementing Meitetsu, courtesy of RIPper and Doorslammer. Update soon(tm) After that, I expect to be working on Meitetsu and JR Central for a bit. Gifu prefecture is now done. A start has been made to the long awaited Meitetsu, thanks to RIPper and Doorslammer. Last edited by RIPper_KR on Sun May 13, 2018 11:53 am, edited 1 time in total.